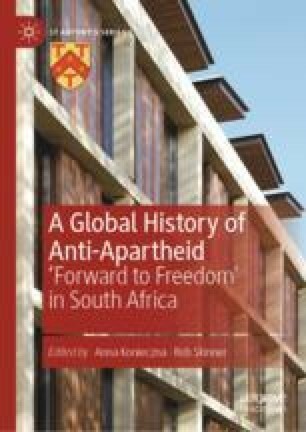 This chapter focuses on the anti-apartheid movement in Japan, in particular the Japan Anti-Apartheid Committee (JAAC), which was a loose coalition of local citizens’ groups against apartheid across Japan. The JAAC serves as an interesting case study for a global history of anti-apartheid movements in the sense that it was located at the intersection between western and Afro-Asian solidarity contexts. Japan’s overall relations with South Africa, both in terms of Cold-War geopolitics as well as economic relations, were similar to those of western countries, therefore the Japanese Anti-Apartheid Movements drew on experiences of Western Anti-Apartheid Movements and adopted their strategies such as consumer boycotts into their own activism. On the other hand, however, unlike Western movements, the inception and early development of the Japanese anti-apartheid activism was significantly contextualised by the Afro-Asian solidarity. This chapter illustrates how the Afro-Asian solidarity impacted on the early development of Japanese Anti-Apartheid Movement. In addition, the role of South African writers who travelled to Japan in person, and/or whose works were translated and published in Japan, in bridging people from the two geographically and linguistically distant societies will be highlighted. Editor’s Museum: Komiyama Ryohei no henshu shitsu (Editorial Office of Komiyama Ryohei). http://www.editorsmuseum.com/. Han aparutoheito undo o kioku suru (Remembering the anti-apartheid movements in Japan, Transcription of lectures and discussions of the conference “Memorizing Anti-Apartheid Movement”, held on December 17, 2017). Research Center for Cooperative Civil Societies (RCCCS). Accessed February 13, 2019. http://hdl.handle.net/11008/1350. Japan Asia Africa Latin America Committee. ‘Nihon AALA to Ajia Afurika jinmin rentai kiko (AAPSO) kanren nenpyo’ (Timeline of the Relations between Japan AALA and Afro-Asian People’s Solidarity Organization [AAPSO]). Accessed August 17, 2018. http://www.japan-aala.org/shiryo/141217.pdf.